There is nothing like the feeling of having Arsenal tickets in hand. It is the feeling of adventure, possibility. Also, the opposite feeling–coming home, groundedness. Last month, when the Arsenal v. Olympiacos Champions League tickets in my hand were going to be consumed by my husband and a friend and not by me, there were new feelings: loss, envy, coveting. A feeling of what-if-I-take-these-tickets-right-now-and-hop-on-a-plane? In the end, a sacrifice was made. I listened live to the game on Arsenal Player while working and watched Fox Sports in the evening when they replayed the match. The replay occurred at the same time the Cubs took to the field for Game 3 against the Mets. Watching Arsenal was an easy choice for me. I wish the Cubs well, but it would be disingenuous to say that I care more about them than Arsenal, even when I know the outcome of the match. Also, let’s face it. Cubs v. Mets was going to last a lot longer than Arsenal v. Bayern. The replay of Arsenal v. Bayern got cut by Fox Sports (a big section of the second half) apparently because their viewing schedule fell behind when Kansas City v. Toronto lasted far past the scheduled time. Seems that Blue Jays really struggled to get three outs each inning. As an aside, what an awesome match for Arsenal! Tactics, execution, great goalkeeping and a big dose of good luck to end 2-0. Now all we have to do to get to the round of 16 is win every game. Ugh. (That’s an exaggeration, but not much of one.) We’re still in 4th place in Champions league group F because the tie breaker against Dinamo Zagreb is head-to-head goal differential, and they won the first match. If we’re able to win the next match against Dinamo and against Olympiacos, the next tiebreaker may be more favorable. But that will become harder as time goes on and injuries take their toll. We had an important one against Bayern with Aaron Ramsey going out. Alex Oxlade-Chamberlain is going to have to step up. We play Bayern Munich again week after next, in Munich. The other reason I could skip watching the game live was that I had a distraction, a very positive one. 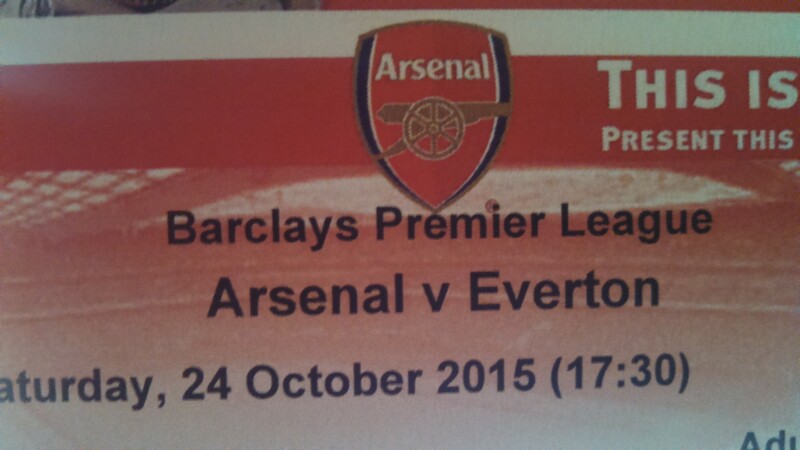 The Arsenal v. Everton tickets for this weekend were in the bag, literally. I printed them out in the morning. Each time there’s an upcoming match that I’ll attend, the actual season ticket holder must use Arsenal’s electronic transfer system to permission the tickets. As mentioned in a previous post, the system is anything but straightforward. There are pages of documentation explaining how the site works. The season ticket holder may designate a representative to manage ticket transfer, that person must set up recipients in the system (including personal logins for the recipients), and when the time comes, the representative must make a transfer request. Each step of the process was arduous and few steps worked the way the many pages of documentation described. The tickets can only be transferred once the match is sold out. 3,500 seats are made available to members six weeks or so in advance of the match. For Premier League matches, they typically sell out very quickly. For the Olympiacos Champions League match that my husband attended with a friend, tickets didn’t sell out until a day or two before my husband was departing. I was less nervous about that situation, proof beyond a doubt that I am a very small person indeed when the tickets don’t involve me. With the Everton match upcoming, I reminded the representative that it was time for transfer early this week and he placed the request. He reported that this was the easiest time yet; unlike previous times, the system worked well and he was able to use it comfortably. Then I must log into the transfer system to complete the acceptance. Even though it’s becoming more routine, the process makes me very nervous. If something goes wrong, I push the wrong button or lose focus, I’m not sure how difficult it would be to fix the problem. I know I would move heaven and earth to try to get it fixed, but there is certainly no guarantee that it could be. This hangs over my head the whole time I look up my membership number, remember and enter my password, click to accept the tickets and then move through the steps to view my basket and confirm “purchase” at £0.00. There are a few places I always get hung up, I.e., clicking to finalize the purchase but nothing happens, click again, repeat, notice that you have to “tick the box” that you understand the rules, tick the box, click to finalize, get a confirmation. You are then permitted to print the confirmation. Now comes the nerviest part of all, for though I have a confirmation, what I do not have is tickets. Also, the system has just given me, in addition to the confirmation, the most alarming message of all time. On a day that’s just three days in advance of the match and a day or two before I’ll hop on a plane to London, the system tells me the tickets will be mailed to my address in the Chicago suburbs, unless some other request was made. Now, in the whole of the system, there appears to be no place any request of any kind can be made, and so there I am, knowing that there is no possible way that these tickets are going to make it by snail mail to my home before I depart Chicago. Now, I know by now that I am not truly screwed. For what actually happens, after the world’s longest and most excruciating wait, this most pregnant of all pregnant pauses, is that I’ll receive another email, this one with a pdf of my tickets. But each and every time I sweat it out, checking again and again for the email, at some point absolutely certain that the tickets were really and truly snail mailed. And when the pdf arrives? Relief, the sweetest kind. And then joy. I forward them to my husband, I save them to my electronic devices, and I print them. Not in black and white, oh no. I print them in glorious, living color. And I protect them with my life. They are with me now on the plane. In less than two days I’ll pull them out and scan into the Emirates.